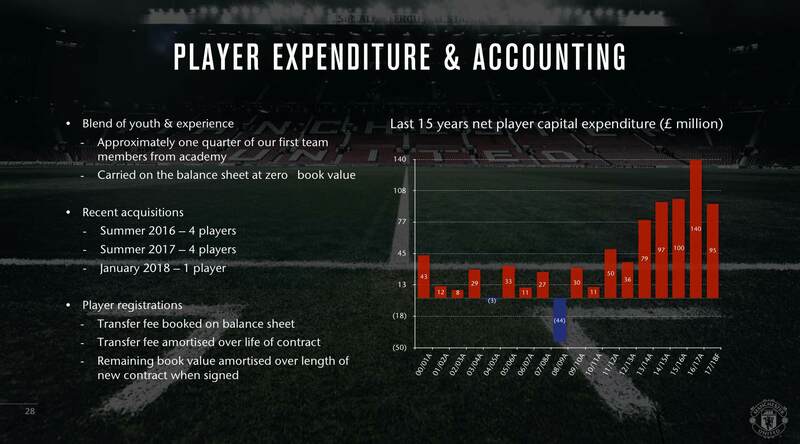 Manchester United’s net spend for the past 15 years according to the club. Discussion in 'Manchester United Forum' started by Devil_forever, Sep 7, 2018. Why would they bother with this when net spend is meaningless? If we had just spent properly in Fergie's last few years we wouldn't have needed to spend so much in the past few years and could have been picking one or two elite players a summer after the new TV deals kicked in rather than trying to rebuild an entire team. The lack of investment of the Ronaldo money and our natural revenue in those years has set us back a decade. Man, this does somewhat highlight the mess we've been in since Fergie/Gill moved on. Of course the money around transfers has changed a lot since then, but when you think of the amount we've squandered on total dross, it's not a great overview of how the club is being run/lack of cohesive planning. you can easily say the opposite of that which is that terrible appointments (Moyes, LvG) and their terrible signings are what caused us so many problems. Since Fergie retired we've basically signed a squad full of players so the old "if we'd done x and x under Fergie" excuse is getting a bit stale, really. It was definitely a valid point at first but it's five years and £500m spent now and that's more than enough time and money for it to no longer being a factor. Sadly, here we are, still playing Jones and Smalling at CB, still with no functional right winger, etc. Disagree. Fergie left 6 years ago and we're still mostly a mess. You can blame him for squad left for Moyes but it ceases being his problem later on. It was due to us buying extremely poorly under LVG and Moyes. We bought for about 400m under both, and literally no one of these players that we spent 400m on are now in our main lineup except Shaw. Others were either good squad players or simply rubbish like Darmian, Depay..etc. Ridiculous to think about it. Lets not forget that the squad Fergie left Moyes were run away champions and a signing or two from being real champions league contenders. Blaming Fergie in any way for the state of the current team is asinine. Exactly. How folks moan about the quality of the team that finished 1st or 2nd since 2009, the era folks reckon we were poor, is beyond me. Im not blaming Fergie but the squad was ageing with little top young talent coming through. Moyes and van Gaal should have rebuilt the team properly. So this is what Ed has been up to since the Burnley game. Totally disagree. That team was seriously starting to creak, but for Van Persie having a world class season we would have been in trouble. Rio, Carrick, Evra, Rooney and RVP were the players playing the most matches, not to mention Vida and Giggs. All of them were on the way down, career wise. The other key contributors were Rafael, Evans, Cleverley and Hernandez. Other than Rafa, none are exactly tearing it up. Outside of De Gea, Valencia and Smalling, Fergie left very little unfortunately. Not bashing SAF if anything winning with that team is testament to him. Fans blaming the board is akin to a rich man son failing harvard law school and blaming their parents for sending them into one. The only thing the board can do is show up some cash. Pick the best available manager. There's really no guarantee you'd win. I'd say the board and the club has done their best to make us better. Sadly it's never enough with fans. Simple remark, we spent little when we had 14-15 very good to WC starters, that's the first decade. And we spent a lot when we didn't had 14-15 very good to WC starters that's the last 5 years. We failed our last transition but the issue wasn't and still isn't spending. Ye. Mistakes or not they have ammend it. We can't always bring the post 2008 fergie as an excuse. The recent state of net spend is worrying compared to previous years. People saying that Fergie left Moyes a decent squad to work with though is quite laughable. There were so many average players in that team, but SAF being SAF, was able to motivate those players to play above their potential. Moyes wasn't. LVG wasn't. And that's why we went downhill since. That's what screams loud and clear to say the appointments since SAF were a failure and something we should of 100% tread more carefully about. Picking the manager is 100% more critical than spending more cash. However feck it. Things are on the up. We have improved since Moyes/LVG. Look forward not backwards as they say. I absolutely and totally agree with this point. And that is how The Glazers have screwed us. Moyes and LVG is not picking the right manager. Not spending enough cash while Fergie was still here and on top is what has contributed greatly to the decline. Amount spent doesn't represent value for money on the pitch. So where are we in the net spend trophy standings? Feel like it was Fergie who refused to spend. He was asked several times and several times he replied the board never refused him money when he asked them and he just thought there was no value in the market. I still think he was just protecting them for whatever reason. The club had a perilous amount of debt at the time. So moyes is the board's doing now? They respect the decision made by the godfather and hire moyes. I don't believe we bought badly at all. I believe we bought players that in nearly every case didn't work out but I think its far too simplistic to simply blame the players and move on. We didn't spend £700m or whatever it was on all terrible players. I would suggest in many many cases we as fans were generally happy with the signings at the point where they were signed and had high hopes for the vast majority of them being successes. I don't recall all that many where we were expecting failure from the start. It makes we question what happened to that list of players almost as soon as they arrived at Old Trafford whereby they almost immediately started regressing. For example had the players bought by LVG actually worked out there wouldn't have been most of the Mourinho spending. The only thing the board can do is show up some cash. Pick the best available manager. That's where they fecked up. They picked the best available at that time. Many here agreed with the appointment regardless of some wories. Which board or owners who's always making 100 percent correct decision? Moyes was an incredibly poor decision. Pep and Klopp - two far better managers with pedigree were available in the years around it, and I believe Jose said he was interested but not contacted (think he'd have been a better fit then than now). People only seemed happy on here because it was thought that the powers that be must know what they're doing, after being used to United barely putting a foot wrong for so long, and with some it was getting behind the manager, knowing it was the right thing to do. United needed a strong personality and a motivator after Fergie. That they couldn't see that or deliver someone better than Moyes is crazy. If the board goes against fergie wishes and employ mourinho some of you would still blame them. Bottom line is if you're not winning people can always find fault and easily says why don't they pick a instead of b. If they pick pochetinno some fans would still grumble why we didnt go for bigger more proven name. Don't get me started if they pick giggs. People would be quick to label them stingy and wanting a yes man. Some objectivity is needed in this case. They at least has some credit for picking a cheque book manager instead of going with cheap options. But not enforcing that midfield with quality players and relying on Carrick being a one man midfield was a shame. See those little red bumps between 2004-2013, otherwise known as the “no value in the market years”? And the big(ish) blue line? I wonder, what happened in 2004 that created a sudden need to start balancing books and reigning in spending? Anyone? The board shouldn't have let Fergie have the only say then. The board should've had a plan every year when it was looming. They should've arranged to have more notice to replace the best manager in the world, who controls so much of what goes on at the club. A 3 year window say, where if one of the best managers becomes available it happens. We would've had some far better options that way. I don't think any of this is asking too much. Don't necessarily agree with the 'can always find fault' line. If a manager with pedigree had come and failed, it'd be much more understandable. Of course people would complain but it'd be less baffling and hard to take.